If your outdoor space lacks shade, a simple and affordable way to add shade is to buy a patio umbrella. However, if you have never purchased a patio umbrella Wicker Paradise suggests following some of the tips below to make your selection easier. Position – Look at where your umbrella will be placed and how much shade you require. Your location will decide if you need a table or free standing umbrella. Umbrella stands – Your umbrella stand will support your umbrella. The stand you choose will depend on how you intend to use your umbrella. Look at an umbrella stand that is strong and one that will survive any weather condition. Remember that free standing umbrellas will require more support than those fitted through a table. Size – Your umbrella should go over your table and chairs. Look at an umbrella that is at least 4-5 feet larger than the intended area. Umbrella frames – There are two types of umbrella frames, and they are metal or wood frames. The type of frame you buy will depend on your patio furniture and your theme. Metal umbrellas can also come in black, white or champagne. Tilt methods – Tilted umbrellas come in collar tilt, crank tilt and push-button. Materials – The most common materials used are PVC, canvas, and shade cloth fabrics. Most PVC canopies can block 100% UV light and survive bad weather. 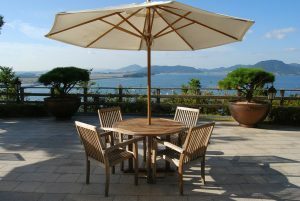 Treasure Garden Umbrellas come in wide variety of umbrella designs to suit all outdoor spaces. Next PostShould you invest in a Memory foam mattress?